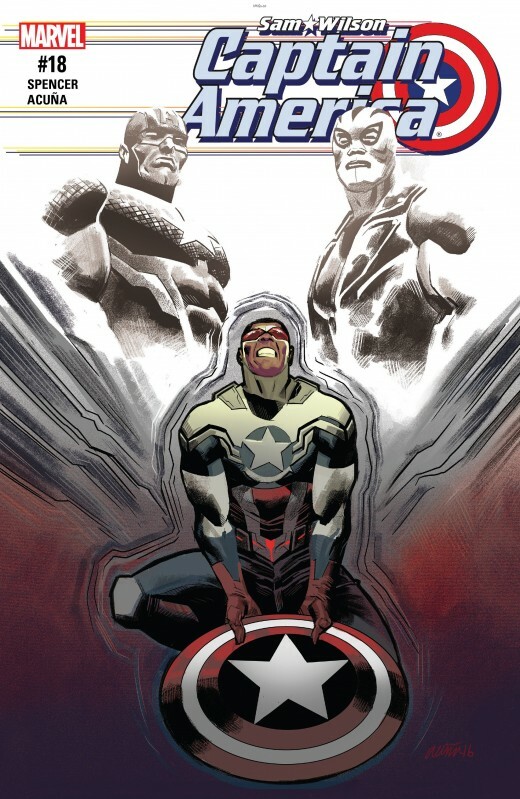 > Betrayed by his friends, persecuted by the media, confounded by pundits at every turn, Sam Wilson struggles as never before to carry the ever-more-weighty mantle of being Captain America! Not really sure how FalCap was "betrayed by his friends" but otherwise that's the gist of his 20 pages of soul searching. Captain Samerica talks to RealCap, the book's cast and a number of Afican American notable citizens to decide if he should release the inconclusive "birds eye view" recording (as per plot point tech), of Americops overzealous arrest of Rage, on social media for public scrutiny. Cap's opinion was completely devoid of any HYDRA influence or more shared MU satisfaction which which is starting to be a bit of a pet peeve. This was another politically influenced soapbox. The art was okay. Good symbolic cover. The implication of Sam's current Avengers team was a small unexpected plus. Although, there were quite a number of panels with already seen flashback imagery and Misty Knight probably deserved a better drawn/involved presence to represent some female balance. Did you like Sam's decision to post? Help the Cancer Society and the Alzheimer Society. Frankly I'm sick of Spencers sermons and he continues to treat extremely complicated issues, like the way our communities and police interact with each other, with utter simplicity and no form of nuance whatsoever. Except we DONT - because it DOESNT happen everyday, and there has never been a shred of evidence to suggest it does. He's clearly trying to reflect the BLM movement and the events that lead to its creation, yet those events are complicated and far from one sided, with the irony being that when Spencer first introduced the Americops it was in a week when both sides of that conflict suffered casualties, including a dozen cops and members of the public being gunned down by a militant member of the black community during a peaceful protest that was enabled by the very police being protested against! Instead what Spencer - who I doubt has ever been a victim of racism in his life- gives us is a 100% racist police force - from the weasily looking desk officer who says that Sam's "not my Captain America" (and we know he's only saying that because he's a RACIST), to the literally faceless Americops who clearly metaphorically represent the idea of the 'blue code of silence' (and you know theyre all white under those masks), to the white, middle-aged, racist, Texan, Republican analogue who funds them - all going up against a black community that is 100% innocent and 100% being unjustifiably victimised. I'm fully expecting that having released the footage that the city will now explode into civil disobedience, but I'm also expecting that the people responsible for that anarchy to be portrayed by Spencer as the good guys, where as the people who's job it is to stop it will be clearly portyrayed as bad guys, and will no doubt use some heavy-handed tactics to do so. Its not politics I'm sick of seeing in comics, its bias - and Nick Spencer is literally oozing with it.